If you’ve been keeping up with our posts on Danny Sangra, especially recently on his involvement with the Design Museum’s Stanley Kubrick exhibition, you’ll have probably picked up that he’s a bit of a film fan. 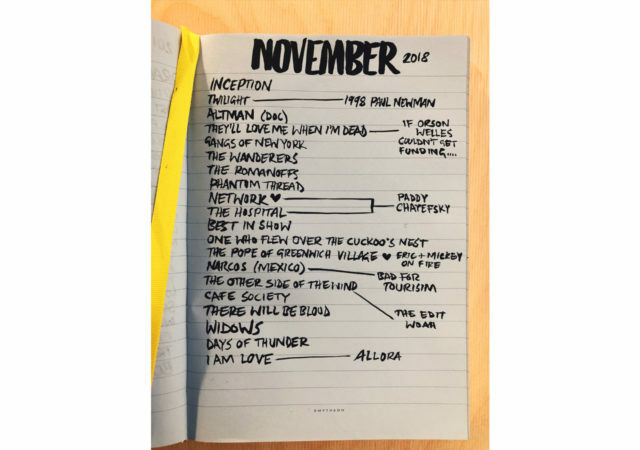 So much so, it turns out, that he posts his own monthly film diary on Instagram. 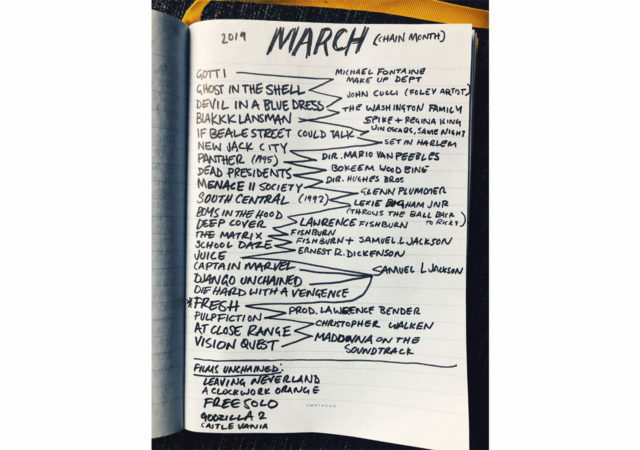 This is essentially a page from Danny’s real diary listing all the films he’s seen that month, alongside his impressions and thoughts on some of those movies. 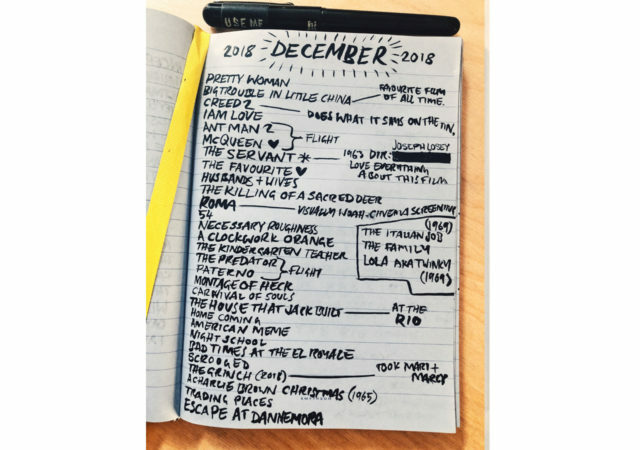 What does Danny’s film diary reveal? An eclectic taste, playing games of linking one film to the next one, and that his current favourite person in cinema is someone who works at the counter of a local cinema. Among many other things. You can see more by taking yourself over to Danny’s Instagram film diary. So, as Danny’s own work as a director continues to evolve, we thought this was a good time to ask him a few questions about his love of film. Why did you start to keep a film diary? People would always ask me if I watched ‘anything good lately’ and my mind would blank. So, the film diary was an easy way to remember. Was the one you document on Instagram its first incarnation, or have you always kept track of the films you watch? Yeah. I’ve never kept any kind of diary before this. What was the first film you remember seeing? Okay, so this sounds really pretentious, but I’ll explain. I never knew the name of the film until 2010 and I saw the film in 1983. I had this one scene stuck in my head from when I was about three or four. I had no context for it, but it was someone in a kimono in a basement with a large barrel. I don’t know why it stuck in my head, it just did. Anyway, decades go by and I ask my dad about this. He said: ‘Oh, it was Kagemusha’. My dad was a big Akira Kurosawa fan. What’s strange is, I’m told the first film I was taken to see was E.T. but I remember nothing from it. However, Kagemusha seemed to make a bigger impression. Do you remember a film or a key moment in a film when you realised you were a fan of cinema? Going to a cinema was always special as a kid, because I didn’t go often. It was a big deal from the journey to the cinema to the bus ride home. But it was more about video stores. Walking into a video store was where you realised whether you were a fan or not. As for a film, I think it may have been Pulp Fiction. It was definitely Tarantino that made me interested in screenplays. I was in high school when Reservoir Dogs/Pulp Fiction came out, and they had such a huge impact. Do you have an all-time favourite film? Do you favour a particular genre or era? Samurai films or science fiction. Are there any films you watch regularly or can watch multiple times? So many. I go through phases. Last year I watched Inherent Vice way too many times. I watch A Clockwork Orange a lot, too. I tend to watch films over and over if they have dialogue I love. That way I can be doing things and still listen. How do you prefer watching films, streaming or on disc at home, or in a cinema? Cinema. It’s not even comparable. No film is as good on the small screen. The New Beverly in LA. I also love the Filmothèque du Quartier Latin in Paris, The Rio in London. Are there any directors who you feel have directly influenced your own film work? Woody Allen, Godard, William Klein, Paul Thomas Anderson, Kubrick, Altman, Todd Solondz, Charlie Kaufman, Cassavetes, Tarantino, Scorsese, Luis Būnuel, Aki Kaurismaki. As a director yourself, have you found it alters the way you watch films? It’s totally has. It makes me stop re-watching films and try to find new things. When watching online it stops me from turning over after two minutes. How do you decide on which films to watch? I don’t really. I just watch the films I want to watch. However, with the list, if I watch too much junk I try to balance it out. Are there any current directors or actors whose films you won’t miss? Paul Thomas Anderson, Tarantino, Todd Solondz, Yorgos Lanthimos, Wes Anderson, Jim Jarmusch, Spike Jonze, Martin Scorsese, Aki Kaurismaki, Sofia Coppola, Darren Aronofsky, Shane Meadows, Jacques Audiard, Coen Bros, Chan-wook Park, Lynne Ramsay. Anything with Parker Posey in it. You’re a keen Kubrick fan. What would you say you get out of his films, in particular? Someone who had a layered vision for a story and took everyone involved on a journey in his own meticulous way. Whether you like his work or not, it is undeniable that it is Kubrick. A selection taken from Danny’s diary pages can be seen below.